I made this card for the ways to use it challenge on Splitcoast. Today's challenge was to find ways to use games or things that we play on our cards. I have an older Stampin Up stamp set called Games Galore and as soon as I read today's challenge I knew exactly what I wanted to do. Do you remember playing this dots game? I used to love playing this game when I was younger. I remember playing this game during World Cultures class in high school, oh I hated that class! LOL I was good at dots, but not that class. For my background I just added a few score lines using my scor-pal. On my Pumpkin Pie layer I embossed it using my Swiss Dots embossing folder. I used my border punches along the white and SU decorative paper layers. For my main image I stamped the dots and then I drew in my hand the word HELLO. I added the flower and brad in the upper left hand corner and a few butterflies above my sentiment. My son was playing while I was making my card and he said I needed some butterflies; he even punched them out for me. Make it a great day and thanks for visiting! I love the bright orange its very bright, and fun. Looks like you did a perfect job for the challenge. Not sure I ever played that game before? 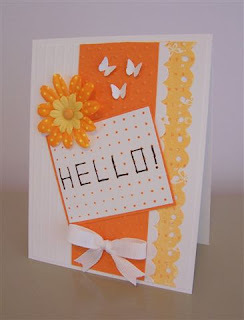 This is so bright and cheerful what a great card and you did a wonderful job with this challenge. I couldn't come up with anything. Lovely- yep- played dots quite a bit when I was ...hhhmmmm....a younger girl! Very cute card.I love that flower.